With the thriving Orange County District, this makes for the location to be! You will feel the unique atmosphere and enjoy the trendy shops and restaurants as soon as you walk out the door. Take advantage of the nearby public transits and experience amenities like no other. 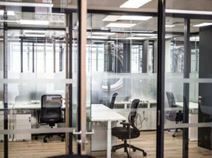 From the private offices to the coworking desks, there is something for everyone. Stop in and visit this center today and let one of the team members show you the way! This centre is in great location less than 40 miles of Los Angeles, situated close to the Metro Plaza. Suites come with high standard furnishings with the use of meeting rooms. Onsite facilities make this an ideal location. This well built business centre located in the busy district of Costa Mesa with easy access to freeways. A modern building with good spec furnishings and easy access with a multitude of services. This stylish and contemporary office location is a fully serviced and exquisitely furnished office center which provides a large number of highly flexible office space, equipped with the very latest in high-tech IT infrastructure, and offering a comprehensive range of specialist support services. This is an ideal corporate location, easily accessible and close to a major shopping mall and airport.